Who would you go out of your way to meet in person? A famous singer? Movie star? Religious figure? Sports figure? I realized there were not many people I would consider bothering in public. Sure, there are people that I admire. People who I enjoy watching or listening to, or even just knowing there are people like them in the world. But, would I consider disturbing those people by walking up to them as a total stranger? Not many. Maybe no one. I was flying back from a business trip from somewhere in Indiana many years ago. My flight was leaving on a Thursday in the early afternoon. The small regional airport I was flying out of was pretty quiet at that time of day. You know, Muhammad Ali is over in terminal 2. Muhammad Ali, you know the boxer? He just checked in and he’s flying out of terminal 2. He’s over there right now. I’m not sure what possessed the gate agent to share that information. Maybe he was a little star struck. My flight was leaving out of terminal 1. But, it really was a small airport, the walk to terminal 2 was only a few minutes. And I thought about whether Ali was one of those people I would be willing to disturb in public. I decided that even if it was just to get a chance to see him in person, it was worth it. Ali was with a few of his family and assistants sitting quietly next to gate waiting for his flight. I found I was more nervous than I expected. There was no one else around. I wondered if he booked his travel purposefully during slow times to avoid crowds. Feeling like a kid again, I approached him and apologized for disturbing him, but said I just wanted to tell him how much he meant to me. Yeah, it was totally a “hero worship” type of conversation. Ten of my children are adopted. Seven of them are black. I live in a state where less than 2% of the population is black. I mentioned to him how much I admired his career and that of his daughter Laila. It’s important for my children to have positive role black models. They need to understand that while we do not judge people by the color of their skin, we also do not limit them. Ali, and his daughter, who was a professional fighter at the time, were people who had great success. Ali couldn’t speak, or didn’t anyway. A result of the Parkinson’s disease. But, he did offer to shake my hand at that point. It meant much more to me than I thought it would. There are people who don’t like Ali as a role model. He abandoned Christianity for Islam. He refused to join the army. He was brash and arrogant. He was unabashedly proud of his race and at times made statements that were construed to some to be racist against white people. But, what impressed me about him, was that he was an individual who was not willing to simply be carried along by the tides of history. For better or worse , he made his own way. Sure, he made some pretty boastful statements. But, he then backed them up. He was not only the only man to win the heavyweight boxing title three times, he was the only man to win it twice. He lived life on his own terms. I have a weird mash-up running through my head. It’s Kanye West, at that time where he rushed the stage when Taylor Swift was winning an award for best Music Video. But, this time, rather than talking about Beyoncé, Kanye is talking about Ali. Imma let you finish. But, Muhammad Ali was the greatest of all time. Of All Time! Yes, he was the (G)retest (O)f (A)ll (T)ime. Rest in peace and thank you for taking the time on an afternoon in Indiana to let a man thank one of his childhood heroes. That is an amazing story! 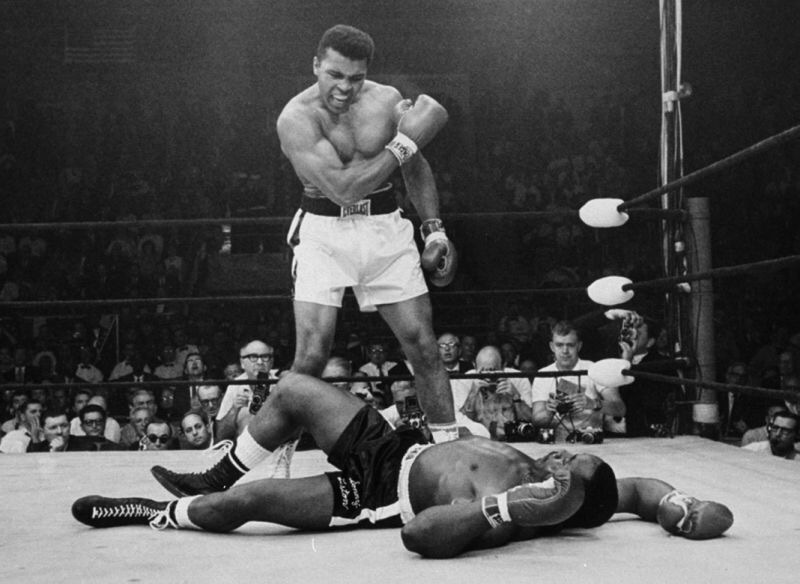 RIP to the greatest! Thanks. Definitely one of my public heroes. And one I was honored to meet.